An article published in the journal “Proceedings of the National Academy of Sciences” describes a research that tries to provide an estimate of the possibilities for the 7 planets of the ultra-cool dwarf star TRAPPIST-1 to maintain an atmosphere. A team of researchers created simulations that took into account the characteristics of TRAPPIST-1’s stellar wind and the possible speed at which the planets’ atmosphere would be torn away from them. The conclusion is that the two outermost planets could maintain an atmosphere for billions of years. The enthusiasm for the confirmation of the existence of 7 rocky planets in the TRAPPIST-1 system progressively cooled down due to various studies related to the activity of this very small but still very active star. In essence, violent flares and stellar winds at very high speeds can erode its planets’ atmosphere. The situation is made worse compared to other star systems by the fact that the planets are very close to their star with the consequence that they suffer the full impact of those phenomena. 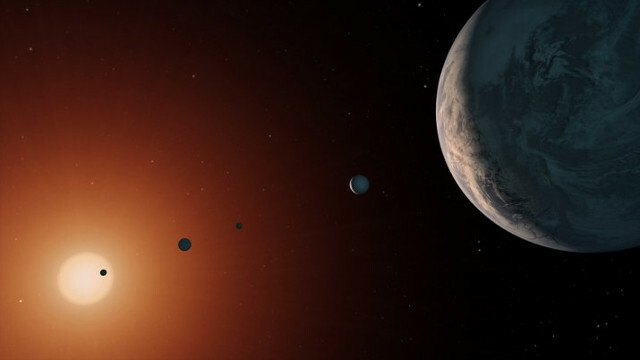 This new research aimed at providing an estimate of the possibilities for the various planets of TRAPPIST-1 to maintain their atmosphere in the very long term, for times of the order of billions of years. This criterion was adopted because in the end the most important question that everyone is asking is if any of those planets is potentially habitable and life forms on their surface similar to the Earth’s are associated with a stable atmosphere. The simulations’ result is that the two outermost planets, TRAPPIST-1g and TRAPPIST-1h, are far enough to maintain an atmosphere for very long times. According to previous estimates, TRAPPIST-1g is within ​​its system’s habitable zone and this means that it’s among those most likely to have liquid water on its surface. The presence of an atmosphere would greatly increase those probabilities. The authors of this research are the first to be cautious warning that there are still many unknown factors and assumptions that influenced their simulations. Changing the parameters it’s possible that the results change significantly but without direct measurements the approximations are unavoidable. The TRAPPIST-1 system is extraordinary for its characteristics and at a distance of almost 40 light years from the Earth it’s in our neighborhood from an astronomical point of view so it allows to carry out many studies. At the same time, it shows how the study of exoplanets is still at an early stage with models that are continually reviewed. Studies of this type take time to be thoroughly developed by gathering as much information as possible to try to limit assumptions. Research on the TRAPPIST-1 system conducted in the course of 2017 will be useful for the following ones and perhaps also for research on other star systems but collecting more data is essential. The observations will continue, even more when new instruments become available.